Debra’s Mindful Eating for the Holidays. How to survive the Holidays without gaining extra weight!! This is my steadfast rule that I follow year round. Before a party have a protein snack that is less than 200 calories. I normally drink a protein shake that has 20g of protein and just 120 calories. You can also eat eggs, or a small portion of lean meat. I follow this rule even if dinner will be served at the party so that I can say “no” to the wonderful assortment of appetizers that are nearly impossible to avoid if I am hungry. Beer has fewer calories per ounce, but wine is served in smaller portions. The average class of 4oz of wine has 90 calories while a pint of beer has 150-160 calories. Commit to drinking a glass of water between beverages. This will help you to drink less and will also keep you hydrated which helps how you feel the next day as well. Standing near all the delicious foods will only make you want to “graze”. Commit to eating only food that you put on a plate. Fill your plate one time and try to reach for a small plate if possible. If veggies, fish or meat are an option make those the largest item on your plate. It is easy to cross our workouts off the daily schedule during holidays, but this is the most important time to stay focused on making the time to workout. Think of shortening your workouts. Choose from the Joyful Breath Yoga class archive a 20 or 30 minute yoga or pilates class or workout on a machine burns calories and relieves stress. If this is impossible for you, then commit to a small portion of one desert – no going back for seconds! You can also bring some dark chocolate or bake a gluten free desert as a treat for all to share. No one will ever say no to chocolate or desert at their party. 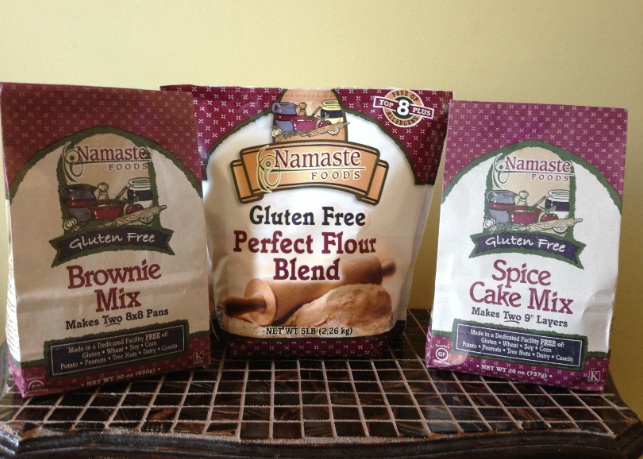 Try substituting Namaste Foods Gluten Free “Perfect Flour Blend” for regular flour. 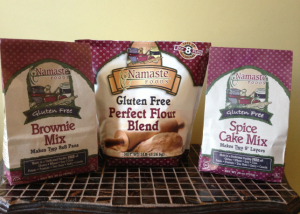 Want a convenient, easy way to bake, try Namaste Foods Gluten Free Spice Cake and Brownies. These mixes are so delicious and made with healthy brown rice flour. You are guaranteed to have a healthy option is you bring it yourself which I always do. My favorites two dishes to bring to holiday events are Roasted Sweet Potatoes and Roasted Vegetables. Remember – Everything in moderation.